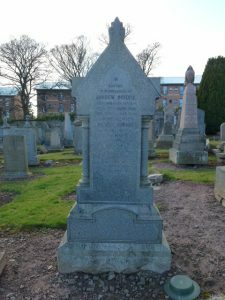 Andrew Ogilvie, the third son of a well known Dundee family, was, for fifty years, a stockbroker in his native Dundee. He became known as the 'Father of Dundee Stock Exchange' having been one of its founders at inception in 1879. Free Church of Scotland: Andrew Ogilvie left the Established Church at the time of the 'Disruption' - a staunch Free Churchman, he was greatly interested in Church work and was strongly associated with Free St John's in Small's Wynd when the Ogilvie family lived in Park Place. Latterly he became a member of the West Free Church, Broughty Ferry. As a young man, Andrew Ogilvie attended St Andrews and Glasgow Universities. His first considered profession was to join the Ministry and, according to the Rev Troup at Andrew's funeral, the quality of the sermons he had constructed while at University was considered very worthy. The call of the Church fell on his younger brother George. Beyond that time, Andrew studied law in the offices of his father James Ogilvie - a prominent Dundee solicitor. His grandfather, John Ogilvie, founder of the family business of John Ogilvie & Son, had also been a notable Dundee solicitor who apparently 'bore a high character' and was known as the 'honest writer'. However, not being strongly attached to law, Andrew Ogilvie spent some time as a merchant in the flax trade, under the auspices of Messrs Brown, before entering the stockbroking business around 1846. The leap from 'law to stockbroking' was not considered to be unusual in Scotland where solicitors were actively engaged in advising clients on their financial investments. From the 1850s, Dundee saw the beginnings of a market in largely, locally controlled, joint stock companies, mainly concerned with railways, banking, water, gas and shipping. Andrew Ogilvie was an active participant in promoting the 'ranching boom' in his native city. Andrew Ogilvie was the third son born to James Ogilvie and Rachel Jameson. His father, James Ogilvie, was a notable figure in Dundee having been, when he died in 1867, the ‘oldest solicitor in the town.’ James’ father (Andrew’s grandfather), John Ogilvie, began in business as a solicitor in Dundee circa 1770. James Ogilvie (Andrew’s father) entered into partnership with his father around 1802, under the designation of J Ogilvie & Son. Continuing with family tradition, Andrew’s older brother John and, subsequently, his nephew John were entwined within the family business of J & J Ogilvie as writers. Andrew Ogilvie, however, was to eschew a legal career in favour of a commercial one. Described as being highly educated and cultured, Andrew Ogilvie attended St Andrews and Glasgow Universities. A calling for the Church denied him, (his younger brother George became minister of the Free Church in Maryculter) he continued to demonstrate an aptitude for a life in commerce rather than in law as his forebears had done. He gained the confidence and respect of his clients with his ‘high culture‘ and ‘old school’ courtesy. Often referred to as the father of the Dundee Stock Exchange, Andrew Ogilvie was their first appointed Chairman and held the post for a total of eight years from 1879-1887. As head of the well known firm of Messrs Andrew Ogilvie & Co, his reputation was of the highest probity and with great foresight – surely an essential requisite in the stockbroking trade. Old Parish Registers. Dundee. Births. 1814, 282/100 70. ScotlandsPeople website. Scotland Select Marriages. Ancestry website. Statutory Registers. Dundee. Deaths. 1898. 282/4 835. ScotlandsPeople website. Memorial Inscription. Western Cemetery, Dundee. Dundee Directory, 1861-62. Dundee Central Library, Local Studies. Dundee Directory, 1864-65. Dundee Central Library, Local Studies. Obituary Book 2 (January 1885 - 13 October 1909). 06 September 1898. p.142. Dundee Central Library, Local Studies. Dundee Courier, 1 September 1898. Findmypast website. Ogilvie, Mary Isabella. (1952). A Scottish Childhood - and what happened after. Oxford. George Ronald. Payne, Peter L (ed). (1967). Studies in Scottish Business History. London, Frank Cass. Dundee Courier, 25 September 1952. Findmypast website. Dundee Directory, 1846-47. Dundee Central Library, Local Studies. Dundee Courier & Argus. 29 June 1867. Findmypast website. Caledonian Mercury, 6 August 1821. Findmypast website. Dundee Advertiser, 1 September 1898. Findmypast website. Dundee Courier, 17 October 1929. Findmypast website. The information above about Andrew Ogilvie has been collated from a range of digital and hard copy sources. To the best of our knowledge it is correct but if you are relying on any information from our website for the purpose of your own research we would advise you to follow up the sources to your own satisfaction. If you are aware of an inaccuracy in our text please do not hesitate to notify us through our Contact page.